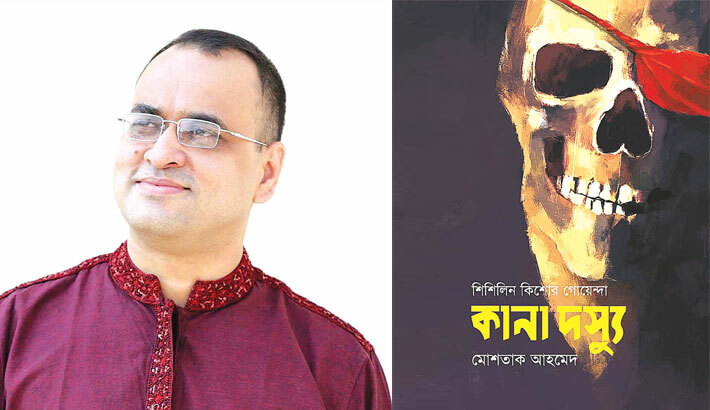 Popular science-fiction writer Mostaque Ahamed is the president of Bangladesh Science Fiction Society (BSFC). He was awarded ‘Bangla Academy Sahitya Puraskar 2017’ in science, technology and environment category, ‘Shishu Academy Sahitya Puraskar 2018’ and ‘Kali Kolom Sahitya Puraskar 2012’. He penned more than 100 books of different genres including science fiction, horror, detective, adventure, parapsychology, travel, and Liberation War. Born on December 30, 1975, in Faridpur, Mostaque Ahamed completed his M. Pharm degree from the University of Dhaka, MBA from IBA of DU and MA in Criminology from Lester University, London. Now he is working as the Deputy Commissioner of Gulshan Division of Dhaka Metropolitan Police (DMP). Recently he has received President Police Medal (PPM) 2019. He also obtained Bangladesh Police Medal (BPM) in 2017. This renowned writer and police officer recently opened up in an exclusive interview with ‘morning tea’. You write a lot. Despite the tight schedule of your professional duty how do you manage time for writing? Writing is a part of my regular routine. It is my childhood habit. I write two hours every morning from 6am to 8am. I try to write 365 days a year. Yes, sometimes, I cannot write for unavoidable reasons but at least I write 300 days in a year. Due to this regular routine I can write a lot. What about your new books which have been published in the ongoing Amar Ekushey Grantha Mela? My seven books have already been published in this year’s book fair. They are science fiction ‘Gama’, parapsychological novel ‘Swapnaswargo’, horror fiction ‘Roktonesha’, two detective novels for teens of ‘Shishilin’ series ‘Kana Dosshu’ and ‘Khuli Baba’ and two books of science adventure of ‘Loo’ series ‘Dur Groher Nishi’ and ‘Roboter Juge’. Besides, some popular books of different series have also been reprinted this fair. You are leading Bangladesh Science Fiction Society (BSFC). Tell us something about this organization. Bangladesh Science Fiction Society (BSFC) is determined to inspire science and help science-based study in Bangladesh. Keeping our goal in mind we are working tirelessly. We believe that today’s imagination is tomorrow’s science. So, we want to make learning science an entertaining process. Our children are going to different parts of the world and achieving success in their science related works. They are doing job at NASA and other renowned institutes. So, they have enough potential. We just need to promote science among them in a creative way. That is what we are doing now. In the last two years’ Science Fiction Fair, we spent money on robotics technology. Our children have made robot ‘Ribo’. This society also publishes magazines and books on a regular basis to promote science fiction. Now we are thinking of patronizing agriculture technology so that our young scientists can concentrate on inventing necessary agricultural equipments. Recently BSFC has opened a Computer Training Center for its members and others. Besides, we are continuing our annual Science Fiction Fair. Recently you have directed a TV drama. Do you want to direct TV drama on a regular basis? I have some thoughts on this. TV drama is a part of my practice for making films. I wish to direct at least one film a year. Now I am working for the pre-production of my first film, ‘Alien Ridi’, a science fiction movie. I hope that it will be premiered in the next year. I have also a dream to work on a subject related to our glorious Liberation War.